In March, I wrapped up my first festival on the Crankworx World Tour. Nothing short of blood, stoke and tears went into marketing our first stop: Crankworx Rotorua. The event took place on the North Island of New Zealand. In a little slice of mountain bike heaven. The air oscillates between the honey-soaked smell of tropical flowers and pungent, volcanic sulfur. Rotorua is an absolute trip. As expected there were long days that blurred into longer nights. Fleeting moments of freedom for training bookended with notifications, phone calls, text messages and emails - all marked "urgent". I can’t claim ignorance or cry out for sympathy. Everyone warned me about the magnified pressure of event time and I'm sure that zero friends want to hear about the tough time I had in tropical New Zealand during a cold Whistler winter. So here's a brief synopsis. The energy put in converted to exponential wins, the event rocked and our team is a blast to work with. This trip report for my Outdoor Stories blog actually unfolds two hours south on the Te Iringa trail near Lake Taupo. Lake Taupo was the staging point for our transition into wilderness adventure mode. Dan and I, still hyped up on the adrenaline from event mode, found balance in counterbalance. 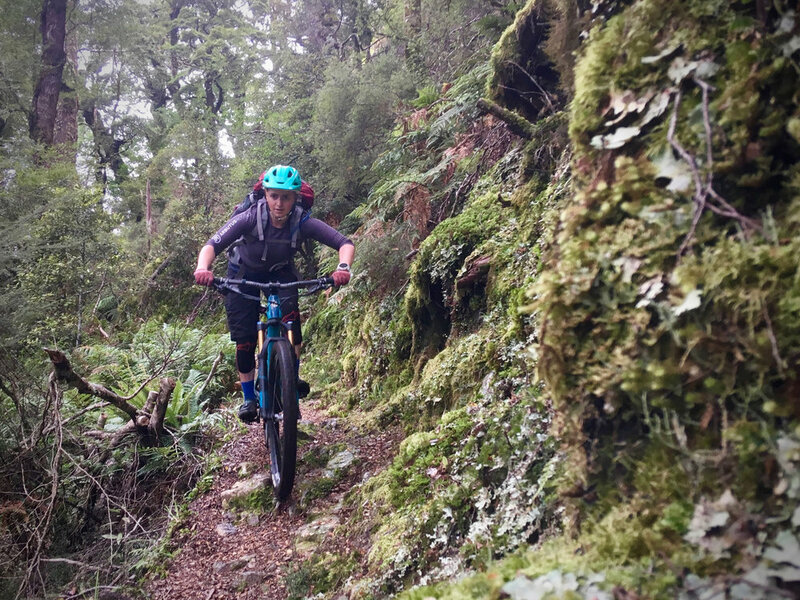 A challenging bike packing trip two days after Crankworx Rotorua wrapped up in the wilderness of Kaimanawa Forest Park. Fresh off the ridiculously good riding in the Whakarewarewa Forest, we had our Yeti SB6 and SB5 in tow. Talented climbers for our bike packing adventures and absolute weapons for the descents. My 60L backpacking bag was heavy and awkward. I’ve taken it on a few bike packing trips now (check out St. James Cycle Trail or Kirwans Hut) and I’m ready to retire it but it did the job. Dan brought a 32L bag from Osprey and raves about the size and weight distribution, it's called the Escapist. In an ideal world we’d get the weight off our back and onto the frame of our bikes but the type of trails and bikes we ride makes that option a bit challenging. Traveling with previously tested gear and not spending the extra cash for the win! Snacks: homemade gels, nuts/seeds, fruit, nut butter packets. Dinner, Lunch & Breakfast: instant quinoa, hard cheese, flavored tuna packets, broccoli salad, avocado, tea bags. We found a bit of information online about the trail on a Pinkbike post from 2015, some TrailForks logs from 2017 and a couple of local websites like NZByBike and RideNZ.co. But there wasn’t anything recently posted online. We considered the trip an exercise in blind faith and an excuse for pure adventure as the Rotorua locals we questioned didn’t know much about the trail either. We quickly confirmed from what we did know that the Te Iringa Track is a hike-a-bike right out of the gate. We pushed for about an hour and a half to a grassy clearing in the forest that made for a perfect lunch spot. The clearing was a former hut site and served as an awesome trail marker. It would be the start of the decent when we returned the following day. But for today we still had a bit more climbing to do. This time it was from our saddles. Perfect lunch spot and a break from the climb. and over a tough mudder-worthy load of deadfall. Nearly six hours and 20.3km from the car park we arrived in a meadow of tall grass. The gurgle of nearby Tikitiki river grew to into rapids as we rode quietly in and out of trees. We were exhausted. I wanted to pull over for food or to drum up energy from somewhere but we rode on hope, hope that we could rest our weary bodies soon. According to the elevation profile on our map, it was just around the corner (a bajillion corners ago). But then, like a desert oasis, the Oamaru Hut appeared in the distance. Warm and welcoming, a beacon of relief: no more riding for the day. We had arrived. Excited but mostly dog-tired. I have a terrible poker face. What do you do when you arrive at an incredibly well maintained shelter and discover that you have it to yourselves? Cook a feast and sprawl out like kings. The 12 bunk, three room hut boasted a fireplace and huge windows. A real stunner of a retreat. As the sun slipped behind the mountains of beech forest and old growth, we curled up in our sleeping bags listening to the crickets and sipping tea by a roaring fire. I brought my kindle to unwind but never turned it on. Between a mild stress headache (aftershocks of event time I suppose) and blissful exhaustion, I dozed off before the moon could make a full appearance. We rose with the sun, as one does when sleeping in the wild in direct sunlight. But the birds and bugs were already humming, stinging and chirping. We were in good company. I have a theory that the return day of bike packing trips always feel like a victory lap. A reward for the previous day’s hard work. Unfortunately, the Te Iringa Track is the exception that broke my (rather unscientific) theory. Our ride (and hike-a-bike) climbed 671 meters in elevation. That’s actually 100+ meters more than the previous day and took us a little over an hour extra to return. Foiled. The Te Iringa Obstacle challenge in full affect. The final descent, that’s why! Just like Crankworx Rotorua, the fruits of our hard work paid off in spades. Spades in the form of a huge, gravity-fed rush down from the ridge line of Mt Te Iringa. The return was so much black diamond, techie fun that our cheeks hurt from smiling. Tight turns, small drops and rooty rock sections. That's the face of a very stoked mountain biker. Heavy backpack be damned, I let that bike flow, no brakes. We knew that once we reached the lunch spot from our previous day’s journey that it was on. We railed down 340+ metres of sustained downhill for over 20 minutes. All the hours of climbing, slogging heavy packs and carrying our bikes worth it. Getting lost in the sweet mix of loam and roots. Explore our route to the Oamaru Hut and the return back on Strava. Then you can flip through my Instagram post to watch the video journey out and back too. At this point I'm hooked. I can't wait for our next overnight bike packing trip. Taking on a physical challenge that matched the mental endurance spent on the festival a week prior had it's highs and lows. The upside is the that sights and sounds of the forest made for a tranquil place to unpack the week’s events. I found the challenging terrain on the Te Iringa helped me clear my mind and sweat out the absurd amount of caffeine and peanut butter from the week prior (yeah, I said peanut butter). However, when we peeled ourselves from our bikes at the end of our journey we needed a solid couple of days of chill. My advice, build a buffer into all bike packing trips, especially the Te Iringa, given with the huge amount of pushing, pedalling and carrying we did. Until next time!